Perfectly non-reflective objects, called blackbodies, produce blackbody radiation when at a uniform temperature. Although the properties of blackbody radiation depend on the blackbody's temperature, this radiation has always been thought to have a net repulsive effect. Now in a new study, scientists have theoretically shown that blackbody radiation induces a second force on nearby atoms and molecules that is usually attractive and, quite surprisingly, even stronger than the repulsive radiation pressure. Consequently, the atoms and molecules are pulled toward the blackbody surface by a net attractive force that can be even stronger than gravity. The new attractive force—which the scientists call the "blackbody force"—suggests that a variety of astrophysical scenarios should be revisited. The scientists, M. Sonnleitner at the University of Innsbruck and Innsbruck Medical University in Austria, M. Ritsch-Marte at Innsbruck Medical University, and H. Ritsch at the University of Innsbruck, have published their paper on the attractive blackbody force stemming from blackbody radiation in a recent issue of Physical Review Letters. The underlying basis of the new force has actually been known for at least half a century: blackbody radiation shifts the atomic energy levels of nearby atoms and molecules. In these "Stark shifts," the ground state of the atom or molecule is shifted to a lower energy by an amount that is roughly proportional to the fourth power of the blackbody's temperature. That is, the hotter the blackbody, the larger the shift. While this much has been known, however, the potential repercussions of these energy shifts have been overlooked until now. In the new study, the scientists have for the first time shown that the Stark shifts induced by blackbody radiation can combine to generate an attractive optical force that dominates the blackbody's own repulsive radiation pressure. 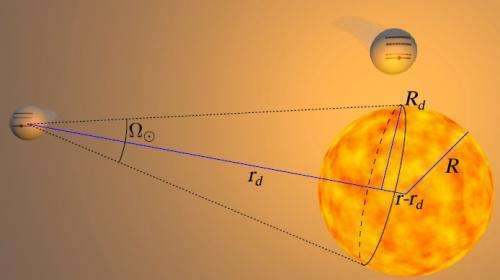 This means that, despite its outgoing radiative energy flow, a hot finite-sized sphere actually attracts rather than repels neutral atoms and molecules, under most conditions. "The most important result is that we point out that radiation forces typically associated with lasers in the lab also exist for every source of thermal radiation," Sonnleitner told Phys.org. "The interplay between these two forces—a typically attractive gradient force versus repulsive radiation pressure—is routinely considered in quantum optics laboratories, but it was overlooked that this also shows up with thermal light sources." As the scientists explain, this attraction occurs because atoms and molecules whose ground states are shifted to lower energy levels are drawn toward regions of higher radiation intensity—in this case, blackbodies. The scientists calculated the strength of the attractive force, and discovered some interesting things. First, the force decays with the third power of the distance from the blackbody. Second, the force is stronger for smaller objects. Third, the force is stronger for hotter objects, up to a point. At above a few thousand degrees Kelvin, the force changes from attraction to repulsion. In their study, the scientists showed that the blackbody force of a dust grain at a temperature of 100 K is much stronger than the dust grain's gravitational attraction. However, for a massive star at a temperature of 6000 K, the blackbody force is much weaker than the gravitational force. The discovery that blackbody radiation can impart an overall attractive force on nearby objects could have great significance for many astrophysical scenarios, in particular the interaction between interstellar gas and dust grains. The findings could also have applications in experimental set-ups, such as the effects of hot microstructured surfaces in vacuum chambers. However, the scientists note that the attractive blackbody force will be difficult to measure in the lab because it will be very weak under typical laboratory conditions. "Since the forces are very weak, they beat gravity only for small particles such as cosmic dust," Sonnleitner said. "These sub-micron-sized grains play an important role in the formation of planets and stars or in astro-chemistry. Apparently there are some open questions on how they interact with surrounding hydrogen gas or with each other. Right now we are exploring how this additional attractive force affects the dynamics of atoms and dust." © 2013 Phys.org. All rights reserved. Dark matter: there's a force acting that looks like there's more matter than can be accounted for. Does this account for it? I wouldn't have thought so. The Universe is apparently missing 90-96% of the matter it "should" have. This force as stated, is very weak, and only just scores a little past gravity. Though it should now lessen the figure of what is missing. I read a while ago on wikipedia there is already something accounting for there being no dust in the solar system. Is this a different force or is this a sensationalist article? Maybe that was the regular radiation pressure.. This may be part of the clumping effect that starts the process of star creation from dust. The arxiv version of this paper: http://arxiv.org/abs/1302.3031 . The comparison with the Casimir force was my first thought as well. The AC Stark effect is well known, so I think it is a little overly dramatic to claim that this is a new force, rather it is the recognition of an effect to which (presumably) little attention had previously been paid, but which is implicit in the interaction of black bodies and quantum (and probably also classical) objects (that are capable of being polarized). It may be that measurements have not revealed this force before because it is only significant in systems with (temperature) anisotropy that are sufficiently small and hot. Small hot systems tend to cool quickly until equilibrium with their surroundings is reached (at which point this force vanishes). It's not a new force, but a new interpretation/manifestation of Quantum Electro Dynamics. Essentially electromagnetic in the nature of the 4 known forces. Objects can attract or repel based on their exchange of virtual photons. I also like SteveL's comment that this could be a catalyst for dust clumping to form new bodies. Is this another way of explaining electron/hole pairs?